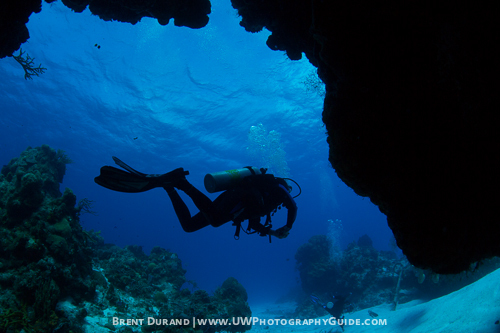 Cozumel has a reputation as a world-class dive destination and ranks high on many U.S. divers’ wish lists. I love adventure and wide-angle photography, so when the opportunity came to visit a few resorts and shoot underwater photos on behalf of Bluewater Travel, I jumped at the opportunity. The plan was to visit 4 resorts in 7 days and dive as much as possible around a busy work schedule. Cozumel is a small island located off Mexico’s Yucatan Peninsula. 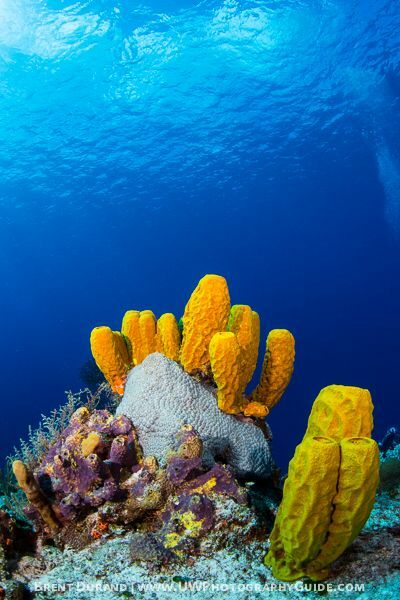 It sits across the channel from Playa Del Carmen, about an hour south of Cancun, and divers have the opportunity to explore many dive sites that comprise a section of the Mesoamerican Reef (second largest barrier reef in the world). 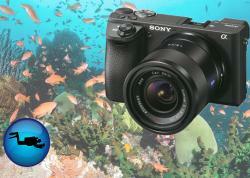 To learn more about Cozumel diving, check out Bluewater Travel’s Cozumel Dive Travel page. Drift diving is the name of the game in Cozumel and can present some minor challenges for underwater photography, but hey, that’s what makes it fun. 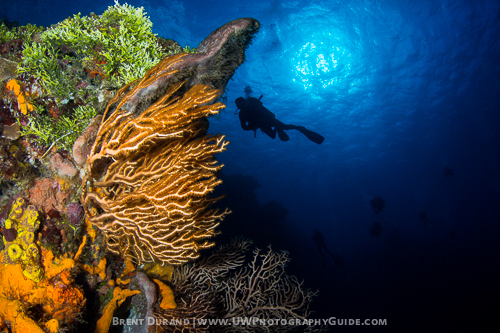 Check out my article Diving on the Drift for tips on shooting while drift diving. 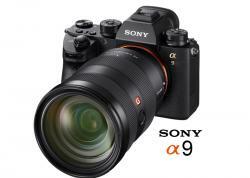 And macro shooters need not fear, as there are some fun subjects to track down while beach diving off the resorts. 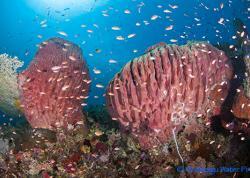 Below is a small sampling of photos from diving Cozumel followed by info on the resorts visited. Breathe deep and enjoy. 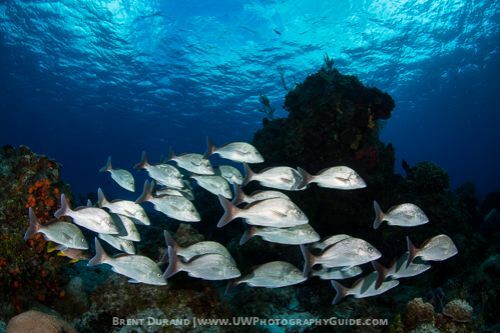 Schoolmaster snapper hover above the reef at Yucab. A small dome port adds a nice effect to a small school of white margates at Tormentos. A simple composition showcasing yellow tube sponges at the San Francisco Shallows. The usual suspects: Hawksbill turtle, french angelfish and yellowhead wrasse. Massive swim throughs that I can only describe as "hobbit-like". This scene is from Palancar Deep. A diver exits a swim through at Palancar Deep. 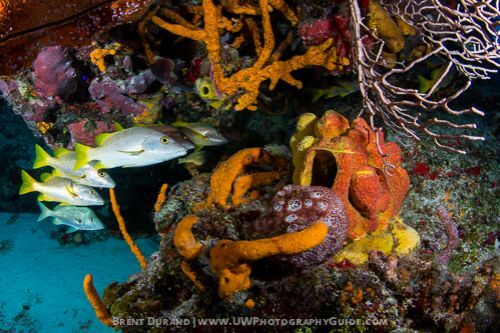 Many fish like to hide out behind coral heads, presenting colorful photo opportunities. 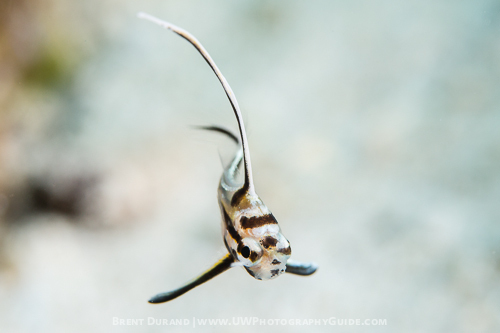 Macro photographers will find some great subjects off the beach, including this juvenile drum fish. 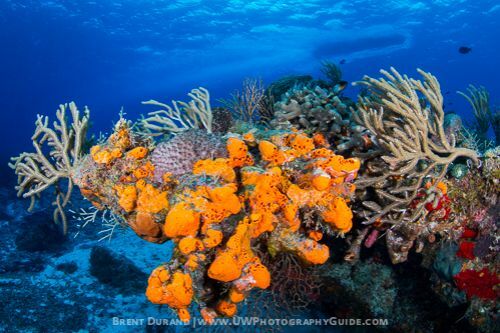 Orange sponges create vivid contrast with the clear, blue water. 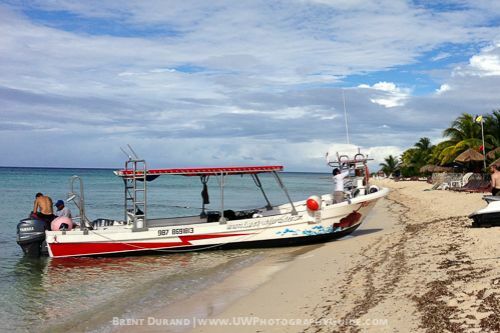 Trusted dive operations use very experienced dive guides and expert boat drivers. 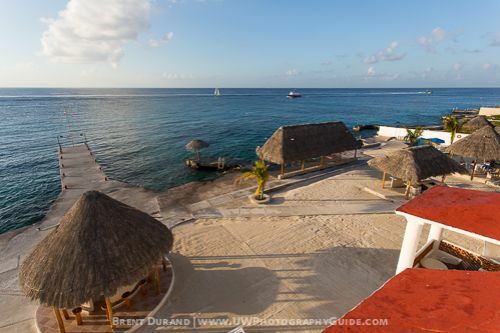 Overview: A resort built by divers for divers with a longstanding reputation, full-service dive operation on-site, unlimited beach diving and a hassel-free Cozumel experience. Dive Operation: Fantastic dive operation in-house. 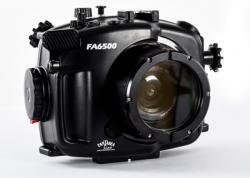 Who Should Go: Serious divers looking for a hassel-free trip while becomming friends with other divers and staff. Overview: With breathtaking views of the Caribbean Sea and an in-house dive operation, Presidente InterContinental Resort & Spa is an intimate, elegant and relaxing destination on the island of Cozumel. 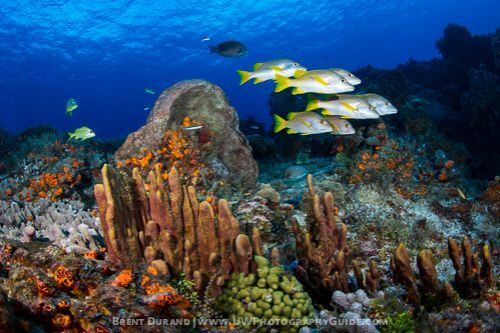 Dive Operation: Scuba Du, located on-site, provides an exceptional dive experience. 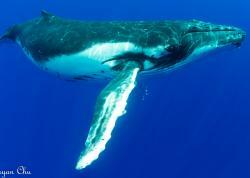 Who Should Go: Divers who value exlegant dining and a quiet beach to relax when not diving. 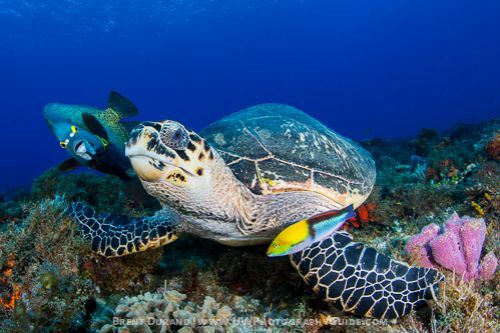 Overview: A premier choice of all-inclusive resorts for divers and families in Cozumel, offering an unforgettable dive trip experience with luxury accomodations. Dive Operation: Aqua Safari location on-site. Who Should Go: Anyone looking for an all-inclusive trip where you can dive in the morning and then enjoy drinks and poolside entertainment. 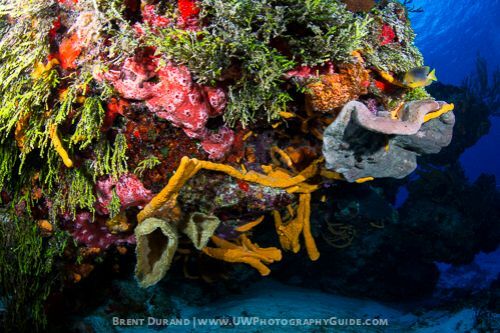 Overview: High-caliber dive operator offering personalized small group dive experiences from any Cozumel resort, with a fast boat, large steel tanks and extra care for photographers. 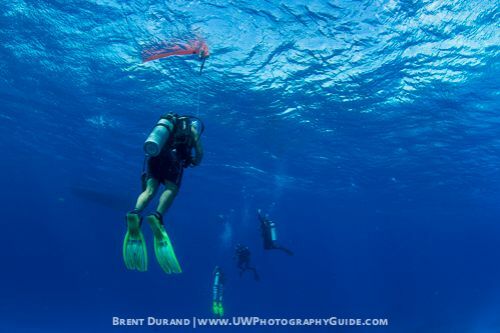 Who Should Go: Small groups and those interested in a personalized dive experience. 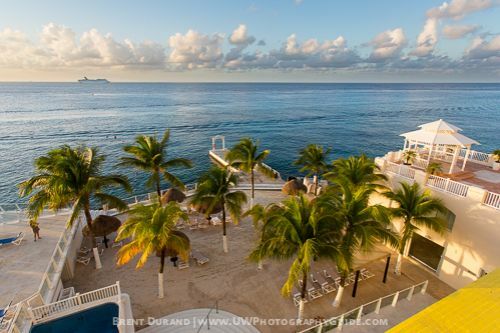 Overview: A comfortable dive resort located right next to town, Hotel Cozumel is a great destination for divers interested in combining diving with dinners in town and a personal choice of dive operators. Dive Operation: Dive Paradise location on-site. Who Should Go: Divers interested in exploring town or booking independent dive operators. Have you Visited Bluewater Travel yet? 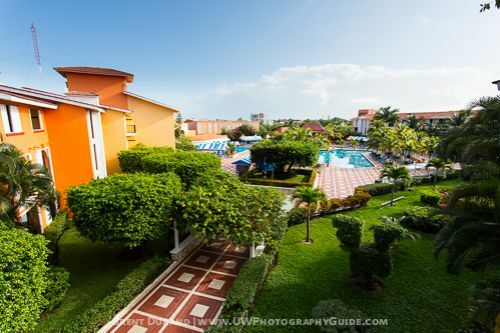 Bluewater Travel is a new scuba travel agency from UWPG's publisher, Scott Gietler, dedicated to providing outstanding personalized service combined with a great online resource to book the best trips possible. Bluewater Travel would like to book your next trip!